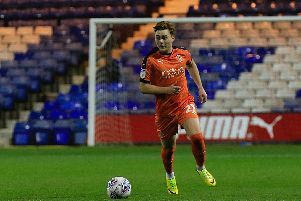 Attacker Harry Cornick knows he has to keep producing the goods for the Hatters with the level of competition breathing down his neck at Kenilworth Road. The 23-year-old started his fifth league and cup game in a row on Tuesday night when facing Bradford City, despite leading scorer from the last two seasons, Danny Hylton being available with his suspension finished. It equalling his best run of starts since becoming a Hatter, when he started five successive matches during October 2017, and on retaining his place alongside James Collins upfront, Cornick said: “It’s good to be playing and everyone wants to be in the starting 11. “There’s a lot of people fighting every day in training who want to be in the starting 11, I think that’s what makes us so strong as I know that I’ve got Hylton, I’ve got (Aaron) Jarvis, Elliot (Lee) can play up top, there’s a lot of people who can fill in the positions. “So you’ve just got to be patient and when you get your chances try and take it. "I’m sure if we lose a game or if we don’t play as well, we can make changes which is good as we've got the squad to do that. Cornick repaid his manager’s faith with a fourth goal of the season, scoring late on to make it 4-0 and when asked his decision to keep the former Bournemouth man in the team, naming an unchanged side for the fourth game in a row, plus not using Hylton from the bench late on, boss Nathan Jones said: “We’re full of real attacking options and they’re at it at the moment. "They’re competing with each other, they want to play well, they want to win games and I had to remind them in there, they’re only as strong as our weakest link. “Harry’s come in since Danny’s suspension and done fantastically well, since Pottsy’s (Dan Potts) been out, James Justin hasn’t looked back, so they’re at such a good level at the minute and it’s very pleasing. “It’s always difficult to keep out Danny Hylton, but Danny’s not had football in a couple of weeks. “So we play a team we think is on the front foot, is doing well and Harry's been in wonderful form. “It would have been easy to bring Danny in or Danny on late on, but he hasn’t really had that (football). “There’s a long way to go yet and we’re going to need Danny Hylton, so it’s not about Danny Hylton. “Dan Potts is back from injury now, there’s a lot of talking points there, but it’s a side in real good form and I didn’t want to tinker with it, I wanted to let them roll on. On the victory which saw Town up to third in the table, leapfrogging Barnsley, Cornick added: “It was a great win for us, we started really well, got the goal, went 1-0 up, obviously they sat deep, so it was tough to break them down to start with. "But once we got the first, we played a bit better football and it allowed us to be a bit more fluent. "The second and third before half time which was lovely and then second half was more of a battle, we had to stick to it and try to get the three points and get the fourth in the latter stages. “As soon as we got the first we started playing a bit better, we started finding Elliot and (Andrew) Shinnie on the edge of the box and then Pelly (Mpanzu) made some runs. "It really worked well, they (City) didn’t lose faith, but they didn’t have anything going forward.